Several different forms of words are found on the TASS Windows and prints. They range across quotes from Stalin or from his office at least, from government, enemy and ally newspapers, on to captions and to verse, itself of several different kinds. 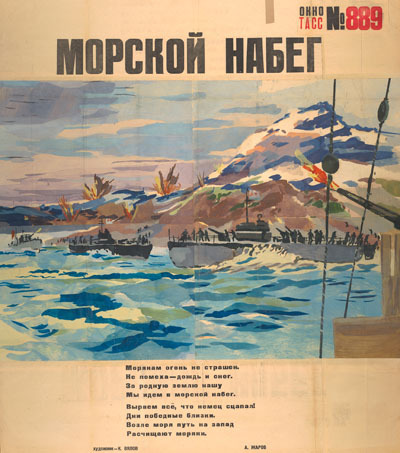 While the addition of captions to posters is familiar to the British, the use of quotation and verse is relatively rare. Not that it was always good verse: it was most successful when it was cheeky and brought out the covert messages in the poster images. Some of it is sentimental, some heroic and some patriotic, all of which have their own powerful effects in wartime. Translations are to be found in the hotspots in the poster links. In the verse, the aim is to capture the spirit, rather than strive for literal accuracy. The writers are presented in alphabetical order, covering both the TASS windows and the prints. The name Dem'ian Bednyi was a pseudonym. The echoing consonants of his name in Russian mean something like Damian the Poor. It was adopted by Efim Alekseevich Pridvorov (1883-1945). Born into a peasant family, he managed to enter higher education at the beginning of 20th century. He turned to poetry and, as his pseudonym suggests, devoted himself to representing the poor, particularly the peasants, by using their language, and the rhymes and poetic folk forms they loved. He was a loyal supporter of the Party after the 1917 revolution, and was close to members of its leadership. He suffered like many others, however, during the Stalinist purges. 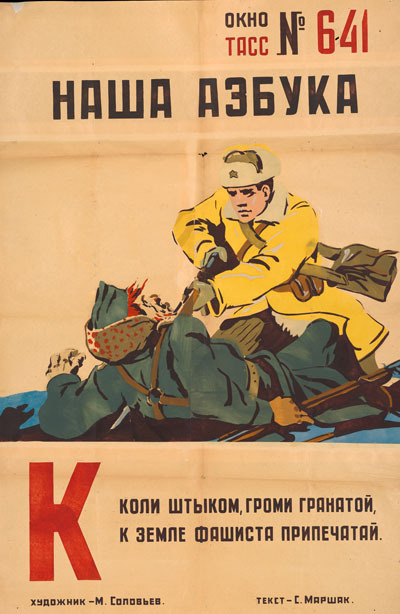 His devoted support through his poetry and work on the TASS posters enabled him to retrieve his loyal reputation. He died just after the end of the war. Osip Brik (1888-1945) was a literary critic and theorist, a member of the Formalist school, a Futurist, an advocate of avant-garde art, and maker of documentary films. During the Civil War he worked for the Cheka (secret police) but was dismissed for negligence. He and his wife Lilia (Lili) were close friends with the poet Maiakovskii in the 1920s and formed a complex ménage à trois. 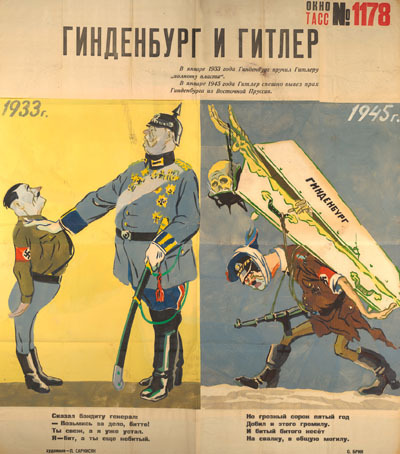 Brik tolerantly defended his friend to the end, and even posthumously after Maiakovskii committed suicide in 1930. 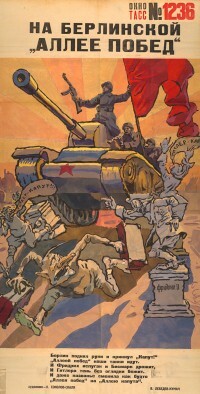 In the 1930s, when Socialist Realism was enforced, Brik was severely criticised by the Party for his views on art. Brik was better known as a literary critic rather than poet but collaborated in the TASS windows from the beginning. His literary and critical work was suppressed until after the break-up of the Soviet Union in the 1990s. Nikolai Berendgof (1900-1990) became a published poet after the revolution, especially during the 1920s. Interestingly one of his published books has a constructivist style of cover, placing him among a modernist elite who were subsequently sidelined for their attention to form over substance. It figures now as a rare book, intriguingly entitled Doktor Noch' (Doctor Night). The subtitle states it was his third collection. One source suggests he burnt his first collection. Some change of heart is evident. 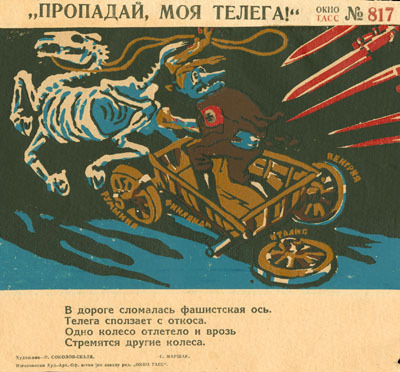 Berendgof provided the words for a number of popular songs in the Soviet period, for example, 'Kak khorosho v strane sovetskoi zhit'' (How good it is to live in a soviet country). 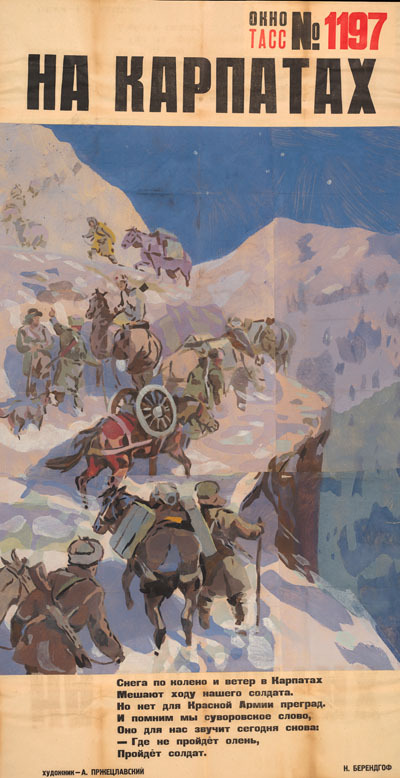 TASS 1197 captures the heroism of soldiers and horses in adverse winter conditions. 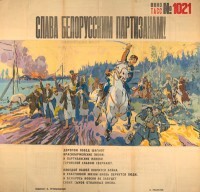 TASS 1196, not yet digitised, celebrates the victorious Soviet army's progress to Berlin in March 1945. 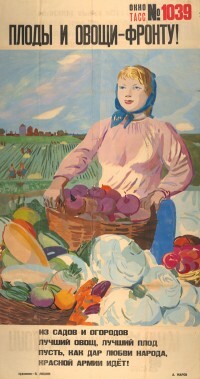 Vera Inber (1890-1972; real name Shpenzer) was born in Odessa. Her father was related to Leon Trotsky, who lived with the family when Vera was a small child in Odessa. She was one of the first generation of women to receive a higher education, attending Odessa University. She became a poet (associated for a time with the Constructivists in the 1920s), prose writer and journalist. She lived Europe with her first husband before WW1, returning to Odessa in 1914, and moving to Moscow in the 1920s. Her career as a journalist and her proficiency in other languages allowed her to travel. During WWII she lived through the siege of Leningrad and wrote poems and a diary documenting the heroism of her fellow-citizens. 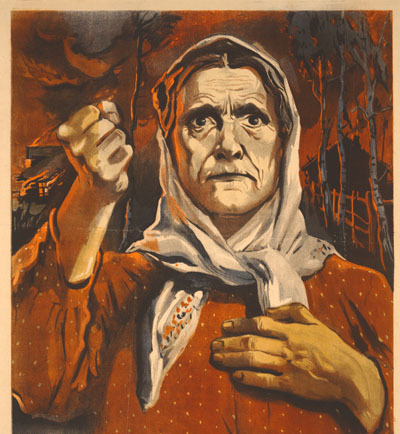 In 1946 she was awarded a Stalin prize for works created in the siege. As far as is known, Inber did not contribute to the TASS Windows. Her verse is quoted on only one of the printed posters in the Nottingham Collection, ‘Avenge your People’s Pain!’ (1943). It is difficult to know whether this poem was composed for the poster or whether the image was created in response to an already existing poem. Vasilii Lebedev-Kumach (real name Lebedev, 1898-1949) was the son of a cobbler in Moscow. After the 1917 revolution he worked in state propaganda, and then studied at Moscow State University. His satirical verses and stories appeared in newspapers and journals, and he published several collections. He became well known as a song lyricist, writing for both music theatre and film. He helped create the genre of the mass Soviet song. His best known examples include ‘Song of the Motherland’ (1936) and ‘ A Holy War’ (1941). He served in the navy during the war while also writing prolific material for the TASS Windows operation and for newspapers and magazines. A collection of his war poetry subsequently ran to many editions. Vladimir Liushin (1898-1970) trained at the Moscow Stroganov school from 1913, and after the revolution graduated from VKHUTEMAS (Higher Artistic-Technical Studios), 1924. Liushin was an early member of the Society of Easel Painters (OST, established by Shterenberg) which existed from 1925-1931. Liushin exhibited with them. Early in the 1930s he joined the IZOBRIGADA (Art Brigade) painting contemporary industrial scenes set in factories and on the new collective farms. He also worked in the theatre, designed political posters and illustrated journals, books and contributed cartoons to newspapers. His one war poster in the Nottingham Windows is set on a collective farm. He contributed more than 30 works in all to the TASS windows. He continued to exhibit as a painter after WWII. Samuil Marshak (1887-1964) was a poet, translator, and children’s writer, and a protégé of Gorky and Chaliapin. Faced with restrictions in gaining an education in Russia because he was Jewish, in 1912 Marshak moved to the UK. He completed his education at the University of London, where he began translating the English classics. In the WWI he worked with Jewish refugee children in his home town of Voronezh and then began writing stories, songs and plays for children. He headed up the state children's department for literature in the 1920s, and encouraged many famous writers to write for children. His work as a translator was widely valued. His jaunty, playful style often brings a cheeky breath of fresh air to the poetry of the posters. 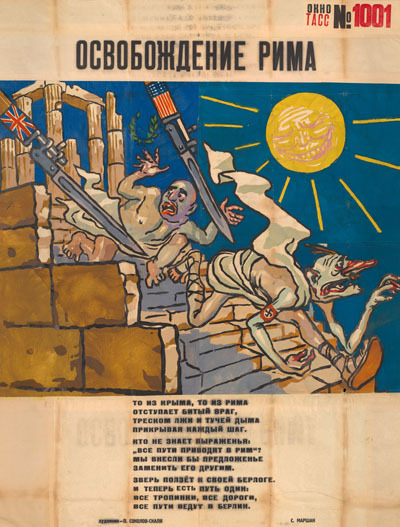 He had a long collaboration with the Kukryniksy beyond the TASS Windows in satirical publications during the war and afterwards. 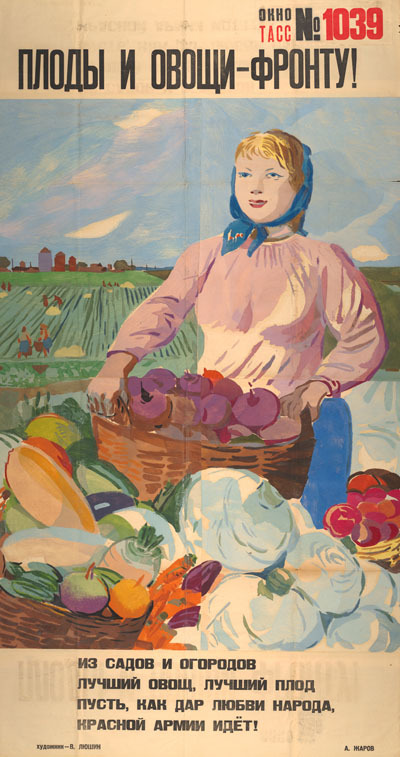 One of the few references to Mashistov is in the Art Institute of Chicago on-line catalogue. It notes his collaboration with composers such as Prokofiev after the war, but not his dates. 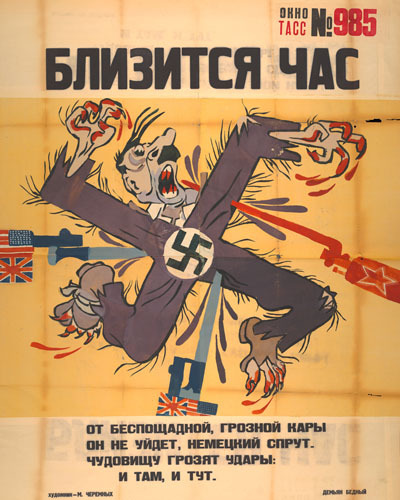 He was a prolific contributor to TASS, but his texts were criticised for their lack of polish. 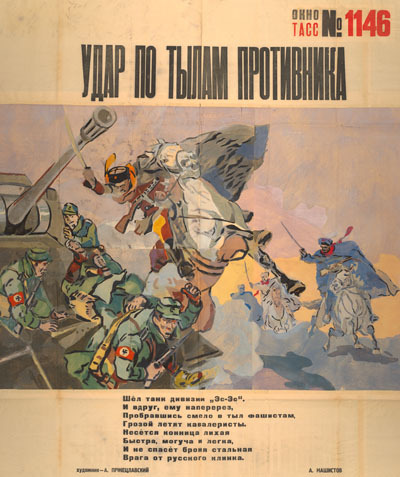 The three so far digitised in the Nottingham collection (where there are more than a dozen examples of his work) are all appended to Przhetslavskii's horses in battle. 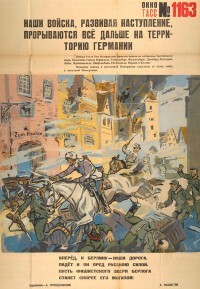 Mashistov attempts to capture in words moments of direct confrontation between the cavalry, the partisans and the enemy. Mashistov's verse operates on a direct and easily recognisable level: alternating rhymes, and a repeating stress pattern in the metre. On Tass Window 1209, the verse is supplied by R. Serapionov This is the only work in the Nottingham collection attributed to him. Searches have not revealed anything about him, any further works signed by him or poetry created by him. The initial R is fairly rare for Russian names, and if he is written up, he would have most probably have been discovered. The name could of course be a pseudonym. This poet must regrettably therefore remain unidentified. The verse echoes the image celebrating the valour and speed of the cavalry in the fight against the enemy. The lines appeal to both ears and eyes. The thunder of the cavalry approaching is tempered by a visual sense of their agile speed and brilliance in manoeuvre. Iosif Utkin (1903-1944) was born to parents working on the construction of the Chinese Eastern railway. He grew up in Irkutsk. In 1920 he joined the Komsomol (Young Communist League), and soon volunteered for the Soviet Far Eastern Front in the Civil War. Subsequently he was sent to Moscow to study journalism and began a career as journalist and published poet. He served in the army in WWII, was injured, losing four fingers, but went back to the front. Utkin was tragically killed in an air crash while returning home in November 1944. 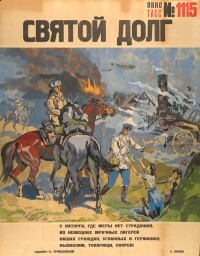 Utkin's war poems and earlier work were set to music and became popular soldier songs. 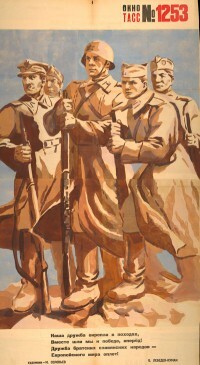 His poem The Nurse was published first in June 1943 in Krasnaia zvezda (Red Star). Antonov painted his Window in response to the poem in March 1944. Aleksandr Zharov ( 1904-1987) was born into a peasant family near Borodino, and became a Party activist from 1918 onwards. He expressed the enthusiastic but naive idealism of early Soviet Russia in his poems of the 1920s. He went on to compose widely popular political songs. In WWII he served in the navy as a correspondent for the journal Krasnoflotets (The Red Fleet Sailor) and contributed his work regularly to the TASS Windows. 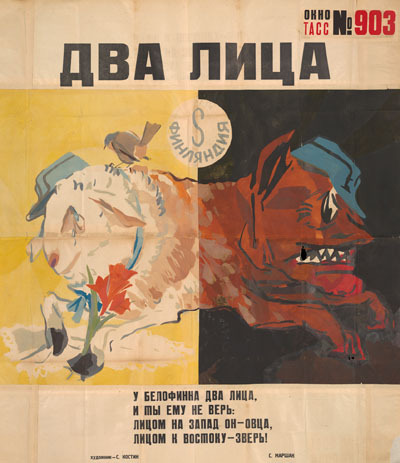 Zharov continued his agitational work after the war with poetry and texts for posters. There are four of his poems currently on the website, and nine more in the collection. The verses show his connection to the sea and his heroic, idealistic view of work on the collective farm and among the cavalry at the front, but his treatment of the enemy is often satirical (TASS 1126). 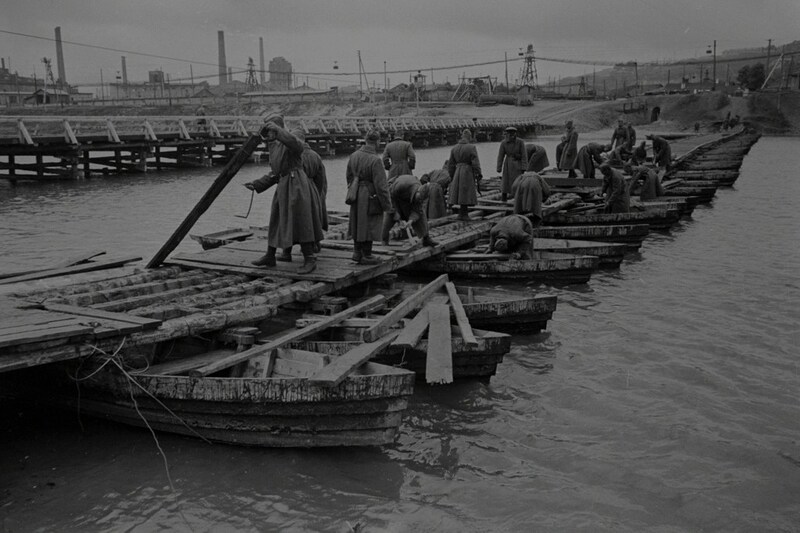 Combat engineers building a bridge across the Seversky Donets River.